Dr. Dudley George Greenfield, M.D., M.R.C.S. A native of Kent, he was trained at Guy’s Hospital and on qualification came to Rushden in 1903. Dr. Greenfield had much skill in surgical work and in the Great War of 1914-18 he gave notable service as a surgeon at military hospitals in France. He met up with several ‘Rushdenites’ whilst in France. Afterwards he became president of the Rushden British Legion branch for many years and acquired a reputation as a speaker and lecturer. 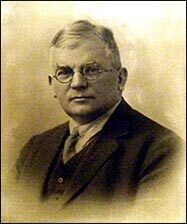 DepartureDr Dudley Greenfield left Rushden for Woolwich for service in the Royal Army Medical Corps at the 10th General Hospital on Saturday morning by the 9.44 train. A number of his choir boys, with the Rev P J Richards, assembled at the station to bid him farewell. Three hearty cheers were given as the train left the station. Dr Dudley Greenfield, of Rushden, who was one of the first in the town to volunteer for active service, is now serving as a lieutenant of the R.A.M.C. with the Expeditionary Force in France. The doctor saw active service in the South African campaign. In 1925 he joined the Urban Council and was chairman in 1929-30. For 15 years had served as Rector’s Warden at St. Mary’s, also being vice-chairman of the Parochial Church Council. He was an artist of considerable ability and his paintings in the impressionist style were seen at many Northamptonshire exhibitions. Music was another great interest and for some years he found time to act as choir master of St. Peter’s Church. The Doctor was a vigorous advocate of swimming baths, and when the Rushden Bath was opened it was he who took the first plunge. Later he was president of the Swimming Club. During the Second World War Dr. Greenfield gave service on medical boards. He retired soon after but continued much of his public work and distinguished himself as the virtual leader of the popular demand for a hospital in the town. His hope was realised in 1948 with the opening of the war memorial hospital in Hayway, and he served on the house committee. He died in January 1950, aged 71.